but the technique sets a new distance record. Nature, 2012. DOI: 10.1038/nature11332 (About DOIs). used to track an entangled photon signal across Qinghai Lake. The statue is Padmasambhava at the Lotus Temple at Gangcha. Sending signals through fiber optic cable is reliable and fast, but because of internal absorption and other effects, they will lose photons - which is a problem when the number of photons being sent is small. This is of particular concern in quantum networks, which typically involve a small number of entangled photons. Direct transmission through free space (vacuum or air) experiences less photon loss, but it's very difficult to align a distant receiver perfectly with the transmitter so that photons arrive at their destination. A group in China has made significant progress toward solving that problem, via a high accuracy pointing and tracking system. Using this method, Juan Yin and colleagues performed quantum teleportation (copying of a quantum state) using multiple entangled photons through open air between two stations 97 kilometers apart across a lake. Additionally, they demonstrated entanglement between two receivers separated by 101.8km, transmitted by a station on an island roughly halfway between them. Though the authors do not make this clear in the paper, their method is currently limited to nighttime communication. Nevertheless, their results achieved larger distances for multi-photon teleportation and three-point entanglement than before, and the tracking system used may even enable ground-to-satellite quantum communication - at least if it happens at night. Quantum communication requires transmitting an arbitrary quantum state between two points, similar to how ordinary communication sends bits (voice or other data) across distances. However, a quantum state is a small amount of information, typically carried by a single photon, so many methods used in ordinary communication are out of the question (including broadcasting). In fiber optic quantum networks, photon loss is large over significant distances, requiring the use of quantum repeaters. Point-to-point free-space transmission - either open-air or through the vacuum of space - is better, though larger distances allow the beam of photons to disperse. Atmospheric turbulence also contributes to photon loss in the air, with the losses increasing the farther the signal must travel. One of the biggest challenges in point-to-point communication, however, is target acquisition by the transmitter and/or receiver. If the ground shifts slightly due to settling or tectonic activity, or atmospheric turbulence makes the receiver appear to move, the laser transmitting the signal can miss its target entirely. With few photons to spare in quantum communication, real-time tracking and acquisition is necessary. The researchers solved this problem using beacon lasers, bright beams that carry no information, but can be used to aim both transmitter and receiver, and wide-angle cameras. As usual in quantum entanglement experiments, the group created entangled photons by stimulating a crystal with ultraviolet light. This produces a pair of photons with the same wavelength, but opposite (and unknown) polarization values. These entangled photons were subsequently sent to detectors, where their polarization quantum states were measured and compared. 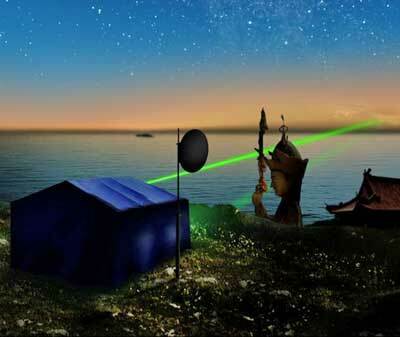 In the first experiment, one photon was sent 97km across Qinghai Lake (using a telescope to focus the beam), while the second was analyzed locally. Using these photons, the researchers copied the quantum state from the laboratory to the far station, achieving quantum teleportation over a much larger distance than previously obtained. However, quantum communication sometimes also requires coordination between two distant receivers, so the researchers set up the transmitter on an island in the lake. The receivers were 51.2 and 52.2 km from the photon source respectively, on opposite shores of Qinghai lake, forming a triangle with the transmitter. The distance between the receivers - 101.8km - was far enough to create a 3 microsecond delay between measurements of the photon polarization. Given this setup, there was no possible way for the two receiving stations to communicate. Yet the photons they registered were correlated, indicating entanglement was maintained. These experiments provide not only a proof of principle for free-space quantum communication, but also a means to test the foundations of quantum theory over larger distances than before. With very large detector separation, quantum entanglement experiments can help differentiate between standard and alternative interpretations of the quantum theory. Though the long-distance aspect is promising, the fact that they set up on the shores of a lake (where no intervening obstacles exist) and that the experiment could only be performed successfully at night indicate its limitations. Author Yuao Chen told Ars via e-mail that they are working on solving the problem for daytime communication, but since the signal consists of single photons, it's not clear how this will work - the number of received photons fluctuated with the position of the Moon, so noise appeared to be a significant problem for them. Point-to-point communication will need to solve that problem as well before satellite-to-ground quantum networks are practical.